Bradington Young Leather Sofas Arrive! Bargains, Bargains, Bargains! That’s a big word to toss around, and one that this Baltimore Furniture Store doesn’t take lightly. But when we can sell you an eight-way hand tied, All Top Grain Leather Sofa, from one of America’s Best Manufacturers at Wholesale-like prices, we use it! We just placed seven beautiful Bradington Young sofas on the floor. These High Quality Sofas are priced from $1295 to $1395 each! That’s right, the same sofas you’ll find elsewhere from $2295 to $2895 can be bought from Cornerstone right now for Hundreds of Dollars Less than anywhere else. But as with all our close-outs, supplies are very limited. And, if past history is any indication, our customers will snap-up these tremendous bargains. So make the trip to visit us today. Our Selection, Quality and Price are sure to give you a value that makes the trip worthwhile from anywhere in the Baltimore and Washington DC area. Free Antique Appraisal Day! Thursday April 12th! It’s that time again! Gather up a few of your Prized Possessions and come see how much they’re worth. 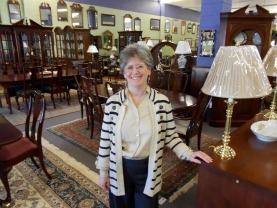 Cornerstone’s own Beth Plein will use her years of antique experience to appraise your pieces. She will be happy to see your antique or “just old” porcelain, china, pottery, old toys, early glass, paper, sterling silver, paintings, furniture and more*. Beth, a second-generation antiques dealer, will be available this Thursday, April 12th, from 10am to 4pm on a first-come, first served, basis. So pack a few things in the car and come visit us in Timonium. You’re sure to get some great information as well as some enjoyable time in Baltimore’s Favorite Furniture Store! *Limit 3 items per person. Further research may be necessary on some items or they may be refered to an alternate appraiser. We’re sorry to say that we are not able to help with jewelry, watches, coins, stamps and military items. No Need for a Sofa Sale at this Baltimore Furniture Store! No need to wait for the Big Box Stores to have a Sofa Sale! That’s because Cornerstone has High Quality Sofas below the other guys Sale Prices Everyday! We just placed over 20 Craftmaster Sofas on our floor. We’ve got American Made Sofas from this fine manufacturer in a wide variety of styles and colors. The sofa in the foreground of this picture is one of Four Sectionals included in the load! We’re doing our best to get them on the website as quickly as possible, but you may just want to rush in to see the entire selection for yourself. So, put down that bag of fertilizer, and come see why Cornerstone is Baltimore’s Favorite Furniture Store! Desks and Bookcases Just Arrived! For our regular customers that have been asking about the next load of bookcases and desks, They’re Here! We just unpacked and placed this group from Whittier Furniture. It includes a great selection of different size bookcases as well as two sizes of desks in two different finishes. Included in the shipment was also two media centers to hold your flat screen television. We started carrying Whittier Furniture last year and have been thrilled to add their well-made, all-wood quality pieces to our New Department. Baltimore Furniture Buyers know that they can count on our store to sort through the many manufacturers out there and bring you a great line. With whittier, we’ve done that once again. Visit us soon to get the very best selection. And if you need your bookcase in a “hard to find” size, remember to check out our line of Custom-Made Bookcases, where we’ll build the piece to your exact specifications. Better still, our quality custom pieces are priced competitively with the Box Stores off-the-shelf furniture! Pictured is a Great Looking Black Leather Sofa from quality maker Luke Leather. This all-leather sofa was discontinued by Luke to make room for some new styles. Cornerstone customers can take advantage of the Low Close-out Price of just $950! But we were able to get just three of these bargains, so it’s “first come, first served”! We also have one “Sofa and Loveseat” combination available. As our regular shoppers know, it’s not often that we’re able to get the loveseats on close-out deals, so please act quickly if interested. Everyone at Cornerstone is working hard to be your “Baltimore Furniture Store”! So whether you’re searching for high quality, like-new, used furniture, or great pricing on Brand New Close-out Furniture, visit us at Cornerstone to see just how far your furniture dollar can go! Mahogany Dining Room Furniture Makes Comfortable Seating for Catholic Business Network Meeting! When the Catholic Business Network needed a location to hold their monthly meeting, Cornerstone made it easy! That’s because our Baltimore Furniture Store is just up the street from the hotel where the group usually holds their meetings. We simply made some adjustments to our Dining Room Furniture Selection to give the group of local business leaders a comfortable place to gather. And the standard “coffee and tea” just wasn’t enough for Cornerstone’s own Karen Spivey. Just like Cornerstone “raises the bar” on what a used furniture store should look like, Karen brought in a beautiful selection of donuts, pastries and fresh fruit for our guests to enjoy. The highlight of the meeting was a wonderful talk given by Baltimore’s Loyal University’s Assistant Basketball Coach Gregg Manning and star player Robert Olson. The two gave the audience many insights as to the work and dedication it takes to build a winning team. They also stressed the importance of the “retreat” the team took together to start the season and how it helped the team become a much tighter group. Beautiful Biggs Furniture from Baltimore Estate! We’ve just placed some fabulous Biggs Furniture from a very well-kept home in Towson, Maryland (a Northern Suburb of Baltimore). This is some of the nicest Biggs furniture that we’ve seen in quite some time! Besides the lovely Solid Mahogany Corner Cabinet you see photoed here, you’ll find an Inlaid Sideboard, a Dining Room Table and Chairs, a Pair of Upholstered Occasional Chairs, and More! Biggs was a very well-known Cabinet Maker from Richmond, Virginia. They used only the Finest Solid Mahogany to construct their pieces. They competed with Baltimore’s Potthast Brothers for high end buyers in the Baltimore and Washington DC area. Their Baltimore Furniture business was so good, that they even had a store on our “Charles Street”- a very upscale business district on the North side of Baltimore. Don’t let this opportunity to own some Regional History with this beautiful furniture. And remember, you can join our Want List to get updates by manufacturer as well as style. So you can be sent a picture of every Biggs piece we bring in to the store! We need to cover a lot of ground to find the high quality-excellent condition furniture that made us Baltimore’s Favorite Furniture Store! We are just in the process of placing some wonderful Estate Furniture from the Severna Park area just South of Baltimore. This entire group of furniture is in Like New Condition. You’ll find fabulous Ethan Allen Dining Room Pieces, a Nichols and Stone Casual Dining Set for the Kitchen, and lots of great occasional pieces for your entire home! Browse our website as we put pieces on as fast as we can. Better still, come in this weekend and take a Peek in the Warehouse to see everything even sooner! Remember to join our Want List if you’d like use to email you photos of pieces that may match what you’re searching for as they arrive. We can search by style or manufacturer for you. Thank you for shopping at Cornerstone! Think Spring!! With the mild winter we’ve had here in Baltimore, it’s really not that hard. Visit us soon to see some of the nicest wicker furniture you can buy. We’ve just put multiple pieces of Lloyd Flanders Wicker Furniture on our showroom floor. You’ll find a sofa, coffee and end tables, 5 piece dinette and more.There are also other nice pieces of wicker from the same Baltimore Home. So now is the time to furnish that porch or sunroom with quality furniture from Cornerstone. All at an “OnlyCornerstone” price! We’ve also been busy placing some beautiful pieces of furniture from a meticulously kept home in Queenstown, Maryland. We’ve got beautiful upholstered Wing Chairs and Chippendale Sofa from Hickory Chair Company. Along with other pieces from Statton, Henkel Harris and other high quality makers. 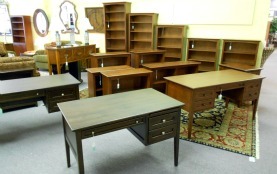 Click our “just arrived furniture” button to see some of this wonderful furniture! Bradington Young Leather Sofa Close-outs Arrive! We’ve just unpacked 6 Brand New Bradington Young Leather Sofas! These are part of a “Close-out” Package from this high end American Leather Manufacturer that also includes some beautiful Recliners. (Due to arrive later). If you’ve been dreaming of owning a fabulous leather sofa- here’s your chance. Better still, our prices are hundreds of dollars less than the other stores “Sale Prices”!! Priced from $1350 to $1395, you’re going to save over $1000 each on these eight-way hand-tied, top grain leather beauties. But don’t wait, the last deal we had like this sold out very quickly! Just a few pictures from this group of sofas have been posted to our website. (And some are sure to sell before they do) So, visit us in the store and we’ll be happy to show you each of these great sofas. Or, stay tuned to our “just arrived furniture” page and we’ll get the rest put on as soon as possible.